Fish do feel pain and they do suffer. The number of fish left in our oceans is seriously declining. Vegetarians don’t eat fish and they never have. Individuals who avoid meat but continue to consume fish are known as pescetarians. Oily fish is often promoted for containing high levels of omega 3 fatty acids. The recommended intake of oily fish is however limited because it contains pollutants such as dioxins, PCBs and mercury. Vegetarians obtain omega 3 fatty acids from rapeseed oil, flax seeds and walnuts and, in smaller amounts, from eggs and milk. Vegetarians who particularly want to boost their omega 3 intake can choose algae or flax seed oil supplements. Over the last century, the world’s annual fish catch has risen from 18 to over 90 million tonnes. UK fisheries caught 600,000 tonnes of fish and shellfish in 2011. 40% of the global marine catch is by-catch with unwanted and unusable species discarded (dead) as a result of incidental capture. However, reform of the EU Common Fisheries Policy includes a ban on discards to take effect gradually between 2014 and 2016. Almost 50% of fish consumption worldwide is from fish farms, known as aquaculture. By 2030, an additional 23 million tonnes of fish will be needed to maintain current levels of fish consumption and to cope with an increased world population. This will have to come from aquaculture. Fish have a nervous system and pain receptors like all other animals. Shellfish are also capable of experiencing pain. Seafood welfare considerations need to take this into account. Farmed fish are caged in cramped and unhealthy conditions causing stress and susceptibility to disease. Welfare issues include skin and scale loss from sea lice, artificial insemination and starvation before slaughter. There are also environmental issues associated with aquaculture. By-catch is the marine life caught unintentionally whilst catching other fish. An estimated 300,000 whales, dolphins and porpoises die in fishing nets every year. Long-line fishing practices kill approximately 300,000 albatrosses and other sea birds each year, with 17 of the 21 species of albatross now facing extinction. The oceans are overstressed and in imminent danger of collapse with 57% of world fish production taken from fully exploited fish stocks. Bottom-trawling and dredging destroys the fragile sea floor. Illegal fishing remains widespread contributing to over fishing and unrecorded by-catch. 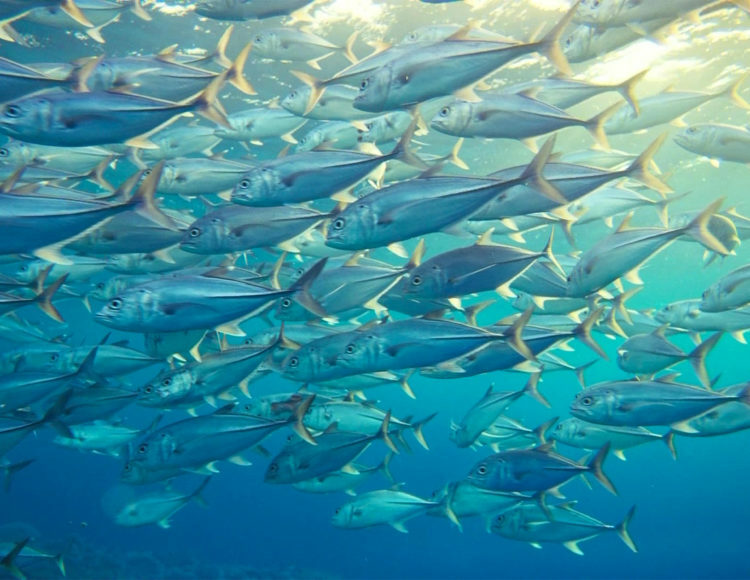 Reducing biodiversity of the oceans could cause all commercial fisheries to collapse by 2050. Fish farming is responsible for pollution, endangering wildlife and it takes five tonnes of wild caught fish to feed each tonne of farmed salmon. Destructive fishing practices such as dynamite and poison are commonly used in some poor coastal communities.